The need for higher efficiency and more renewable resources is driving big changes in our electricity systems. Wind, solar, and distributed generation are replacing central station coal power. Storage is replacing the need for combustion turbines. Our current business and regulatory model is running to keep up with the changes. The current ways of doing business are slowing progress and stiffling innovation. 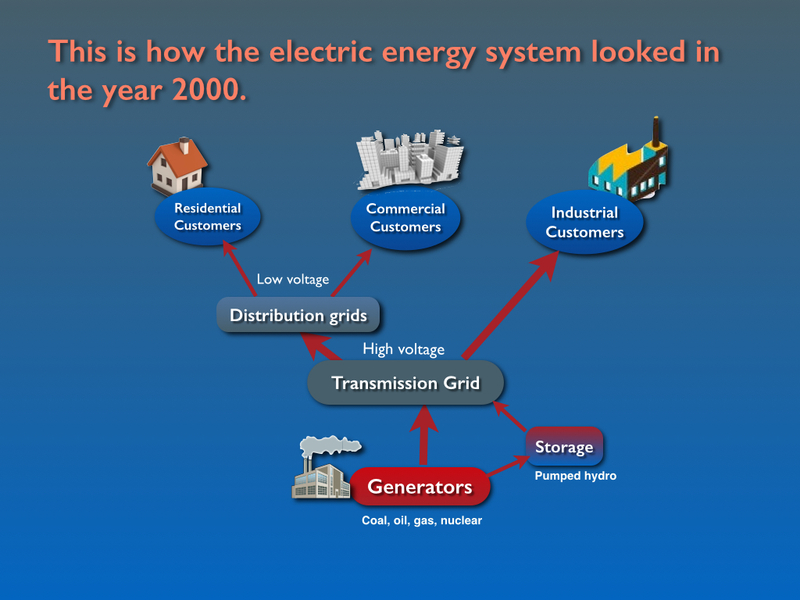 Electric system planners have always treated customer demand as more or less a given. The planners have designed systems that provide energy when it is needed at the lowest overall cost. Investment decisions, like which power plant to build and how big it should be, have been made by utilities under the watchful eye of regulators. The risk associated with the investments is virtually eliminated by price regulation. Utilities and Independent System Operators (ISO’s) operate the generation to minimize the total cost of meeting customer demand. 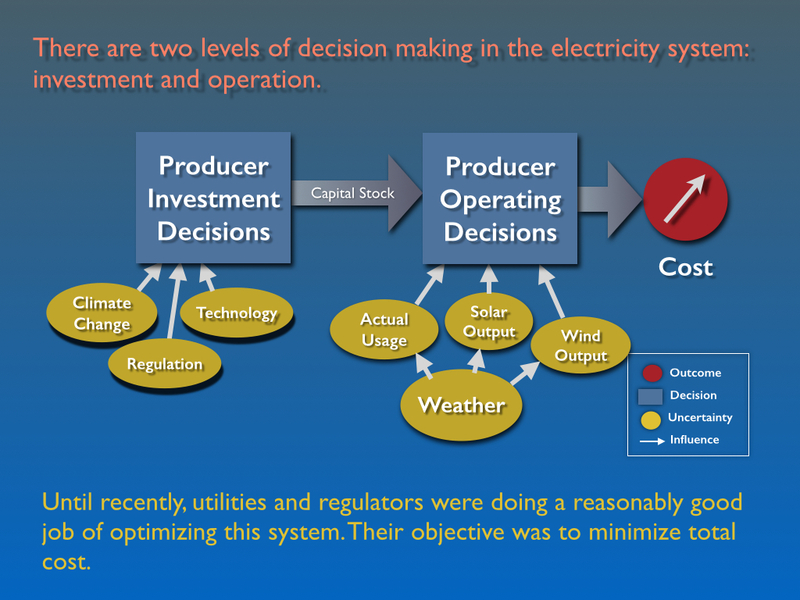 In this model, all the big decisions are made by utilities, bankers, regulators, and system operators. This model worked well for a long time. Now this way of doing business is beginning to wobble. 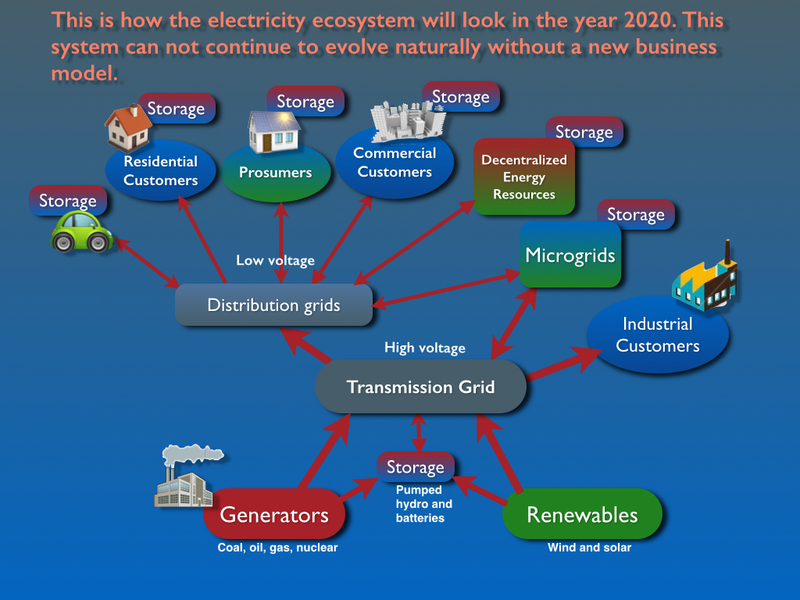 The emerging system is more than just an electricity grid made up of power plants, transmission lines, and power poles. See the figure on the left. It is an energy ecosystem. Customers and other private parties are making almost all of the new generation investment and operating decisions. Customers are making the investments in efficiency. Things are further complicated by the operating characteristics of solar and wind. Their output is determined by Mother Nature, not the utility. The variations in solar and wind increase the need for storage. Homeowners are using rooftop PV panels to generate their own electricity. S0me are installing storage to take advantage of fact that the cost of electricity is time dependent. Electric vehicles offer new opportunities for load shifting. They also add more storage capacity to the system. New computing and communication technologies like the Nest thermostat are making distributed decision making not only feasible but highly desireable. Computing and communication technology is putting orders of magnitude more decision making power in the hands of customers and decentralized generators. More and more customers will turn decision making over to their devices. The devices and their algorithms will act as their agents. It is impossible for us to centrally optimize the investment and operating decisions in this ecosystem. We simply do not have the information required to maximize the net benefit of electric energy to all users. The cost of electricity depends on time and location. Customers need long and short term cost information in order to make sound investments and use energy efficiently. In the year 2000 we had a handful of decision makers. They worked for utilities and large energy companies. By the year 2020 we will have millions of homeowners and businesses investing in generation and storage. With the aid of sophisticated Energy Management Systems like Nest they will all have the power to buy and sell their power and operate their devices in the way that maximizes their net benefit — if they have good long and short term price information for their location. 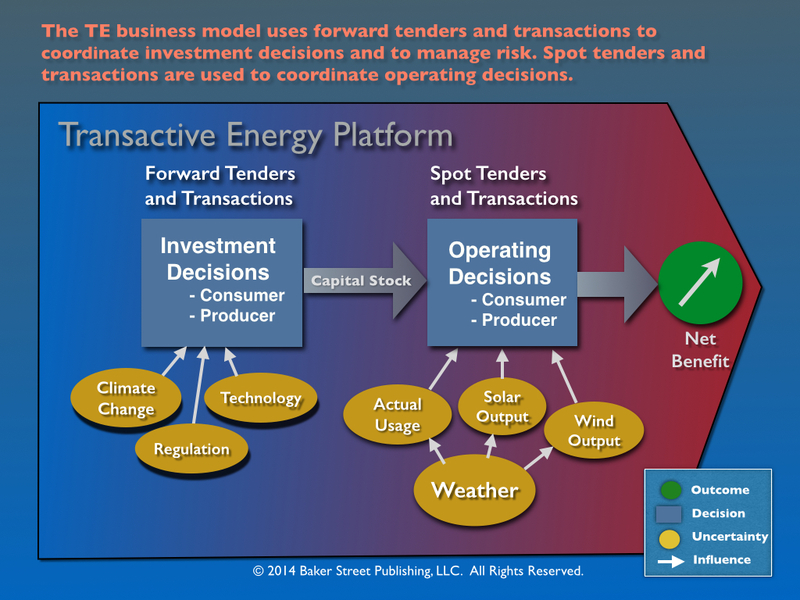 The Transactive Energy (TE) model uses forward transactions to coordinate both consumer and producer investments. Spot transactions are used to coordinate operating decisions for both producers and consumers. Big and small players operate on a level playing field. Everyone has access to all the information on available energy and transport by location. All energy and transport service parties can buy and sell on the same platforms. Intermediaries make the system work. Regulators enforce rules and prevent abuses. Transactive Energy is the leading business and regulatory model for our emerging energy ecosystem. The next step toward implementation is for utilities, regulators, and third parties to design and conduct pilot programs. Legislative mandates will probably be required to make the pilots happen. Independent organizations will be needed to monitor results and capture lessons learned. 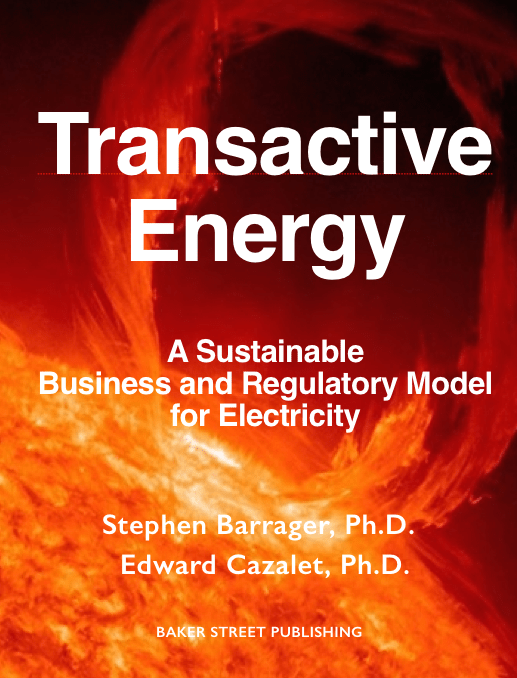 The TE business and regulatory model is described in the book, Transactive Energy: A Sustainable Business and Regulatory Model. The book is available from iTunes for the iPad. It is available from Amazon for the Kindle. To follow industry developments in TE visit the Transactive Energy Association group on LinkedIn. If you would like to receive more posts from Baker Street about the Transactive Energy business model by e-mail, just submit your address here.